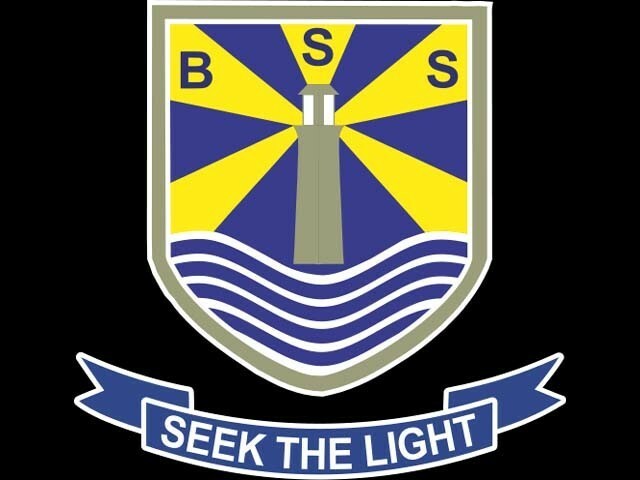 I studied at the Beaconhouse School system for 13 years, but I have never felt this ashamed to call myself a Beaconhouse Alumni. 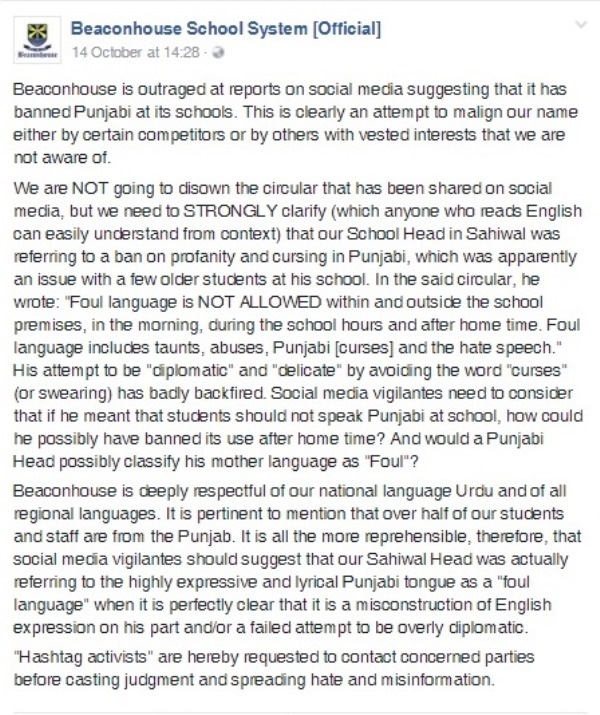 A few days ago, your branch in Sahiwal issued a circular banning the use of foul language in school and classifying foul language as hate speech, abuses, taunts, and Punjabi. The central issue is not the ignorant and outright discriminatory letter issued by your administration. It is not an isolated event or just a grammar mistake made by your branch. It goes far beyond that. The issue is that you categorising a language spoken by 120 million Pakistanis as “foul” reinforces the linguistic bias against Punjabi and other regional languages that has existed for decades. The issue is also your irresponsible response issued after the outrage on social media, which is nothing short of a defensive justification of your actions instead of simply owning up to your mistake. Instead, your use of a sarcastic and taunting tone in your apology; calling people “hashtag activists” and “social media vigilantes”, is not only derogatory to those expressing their concern on this issue in the first place but it shows just how little you are aware of the actual problem behind discrimination against regional languages and how little you are willing to do anything about it. When you ask a child not to speak a language that defines his or her regional identity, you are asking that child to not display his or her regional identity which is not only a direct form of discrimination based on culture (allowing it to be on the same level as discrimination based on gender, race or religion), but it simply goes against Article-251 of the Constitution of Pakistan which binds provinces to adopt necessary measures for promoting, teaching, and using regional languages. I do not disagree with your clause to discourage foul language. But foul language can be foul/offensive/hurtful words in ANY language be it English, Urdu, Punjabi, Saraiki, Pashto, Balochi, or Sindhi. The words themselves are to be discouraged and yes that is the inherent responsibility of the school as well as parents to ensure that. But did you once think of how the parents of the children of Beaconhouse Sahiwal would have felt? Imagine them growing up speaking a language that has been spoken in their region, culture, music, and in all their lives yet their children come back home with a disciplinary letter from their school that says,“please ask your child not to speak that language in school”? What bothers me the most is your half-hearted response. You blamed this on your admin head claiming he was trying to be diplomatic and meant Punjabi curses, but my question is why curses in Punjabi in particular? Curses and swearing in any language are bad, looked down upon and should be banned, but why single out Punjabi? The fact that you felt the need to write “Punjabi” separately in the same sentence as banning foul languages shows the kind of language bias that we need to address. I do not know where this divide came from. It may have been the urban-rural differences and how people associated languages to differentiate between the urban elite and the rural poor or it may have been the portrayal of Punjabi in the media as a language spoken by the illiterate or simply “truck-driver language”. It may have been the constant struggle to choose between one’s mother tongue, one’s adopted language (Urdu) and one’s official language (English) that was brought in by colonisers. What I do know is that when a child is brought up in a household where Punjabi is the dominant language, their ownership of that language is immediately challenged the minute they step into school. I was born in a small village in central Punjab and was raised in a household where Punjabi is not only spoken with utmost pride but is worn like armour. Yet the day I stepped into my first Beaconhouse, everything changed. The language of instruction was English but the “unofficial” language of communication was Urdu. Urdu was a language both the teacher and student were expected to know, but your institution discriminated against students who spoke a different language. You did not go this far and issue letters to warn parents not to let their child speak his or her first language, but it was the way you taught your students. My teachers used to discipline me every time they caught me uttering a word in my mother tongue, even outside of a formal classroom setting. And it’s not just you or your way of instruction, it’s everyone around us who is conditioned to believe that Punjabi is a “bad” language. 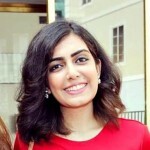 I have been bullied all through elementary and middle school for being someone who had a rural Punjabi background. I have been called words like “paindu” and “jaahil” by my peers every time I was unable to use an alternative word for Punjabi for something. I was laughed at every time I would mistakenly say “godha” instead of “ghutna” when referring to my knee. It made me feel inferior to everyone around me. I have been in the council and provided services to your school for over three years. I represented your school at a local and national level, winning awards and laurels in academics, debates, and art. Yet my grades did not matter, my performance in the debate team or the school play did not matter. What mattered was that I was speaking an “uncivilised” and “uncultured” language; one that I have been born into, one that was an important part of my identity yet still I was taught to be ashamed of ever speaking it in public. That’s not even the worst thing you have done. Being ridiculed was something I can imagine every child with a different first language then Urdu faced in their early schooling, because of the setting of most public and private schools, but you made me lose my faith in my own language. To this day I am unable to fully speak fluent Punjabi. I heard it all around me, I was spoken to in Punjabi and yet still I could not speak it because oh well my school, my teachers and my classmates all taught me not to. Every time my grandparents would speak to me in Punjabi (the only language they know and proudly speak), I would sheepishly reply in Urdu, and they would have to try to change their words into Urdu just to talk to me. It is still an obstacle I have to face every day and I am sure there are thousands of children like me who have absolutely no confidence in their mother tongue as a result of the bias that exists in schools and our society. I spent 13 years of my life in your institution, and with all the good things you have given to me as an institution, you have given me a battle with my regional identity that I fight to this day and I know I am not the only one. It is a matter of concern that it took us this long a time to raise our voice against a bias that has existed in this society for as long as we can remember. 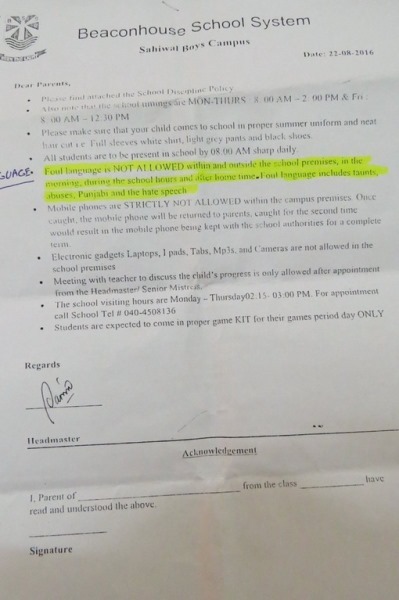 Regional languages in Pakistan have always been marginalised in a school setting, but it has never gone as far as a prestigious institution like yours officially prohibiting its use. This bias has been implicit in nature and so deep-rooted into society that it was hard for people to identify this as an issue that needs to be dealt with immediately. However, when a social institution like a school endorses such discrimination, it raises alarms against the kind of mistreatment of our children in school that we cannot tolerate. As a school, you should be responsible for the actions that you take to ensure a healthy environment for child development. You have not only angered hundreds of thousands of Punjabi-speakers who see this as an attack on their mother tongue but you have also enraged Pakistanis who are concerned about children and the future of their country. You still need to issue a formal and sincere apology to all those people you have angered with your statement. An apology that shows that your institute has owned up to their mistake and has realised the extent of discomfort it has caused and is free of tasteless remarks. As of now, we need a clear policy from your institution stating what the code of conduct of your school is when it comes to the promotion and teaching of regional languages. We need change in the system so children will not have to go through the struggle that children my age went through when they were in school. Punjabi is a beautiful language. It has given us one of the richest cultures in the subcontinent. It has given us Baba Bulleh Shah, Waris Shah, Ghulam Farid, Sultan Bahoo, and Mian Muhammad Baksh. It has given us Bhangra, Dhol, and Gidha. It has given us Stapoo, Kikli, and Pithoo-Garam. It has given us so much more than a regional identity and yet we cannot seem to own it as one. I hope to see a revival, slow but steady, of this culture. And it is you who has to change your collective attitude towards regional languages and adopt non-discriminatory policies that can make this revival happen. You should welcome and celebrate the diversity your students bring to your institution, teach them to embrace their regional and cultural identities instead of being ashamed of it. Let the students “Seek the Light”. It’s because of the ideology of Pakistan which states that everybody has to follow one religion,language and be one.So the people have to hate and destroy their own culture and identity. Ask a serious student of Punjabi. Dont know if you read the link page. It is by a Sikh. Pakistani Punjab is Muslim. Literacy rate was dismal in Punjab because Mulla imposed alien script. Muslim Punjabis convey that their conversion was because of soofism. It is a lie. Conversion was for physical survival and not for any spiritual yearning. A spiritual person will be in quest of finding where he came from and where he will go after death… why he was born to his parents… why with particular DNA, language and who were his native ancestors… Person who converted for material reasons like Bhuttos of Hariyana, other Rajputs like Hayats etc & the haris & kammis who worked on their fields, had guilt and so willingly cut their roots. This cultural suicide is the reason behind breeding of suicidal terrorists in pakistani punjab. Baba Farid didnt use Persian script. Persian script was first used in Mughal darbar. It did not reach to masses till 19th century when Sikh Shahi also started using it though in Gurudwaras exclusively HuruMukhi was used. GuruMukhi kept Sikhism alive. Pakistani Punjabis talk about Soofism but never honor their soofis. No town or road is named after them. Misdiles are named after Afghans, stadium after Libyan Gaddafi but not sufi. Till 18th century hardly 15% Punjab population was Muslim. That is why I say use of Persian script is not even 200 years old.